Mayflower Communications Company, Inc., has been awarded a Phase III SGUE (small GPS user equipment) contract with the United States Air Force Research Laboratory (AFRL), sponsored by the Space and Missile Systems Center/GPS Directorate (SMC/GPSD), to develop a small SWaP (size, weight, and power) security certifiable Common GPS Module (CGM) for the Air Force’s Modernized GPS User Equipment (MGUE) Program. Mayflower’s SGUE program is aimed at the development of advanced GPS receiver technology to support future military GPS requirements. The goal of the program is to develop a NAVWAR (Navigation Warfare)–compatible CGM form factor that will support SWaP-constrained military users. According to the company, the SGUE CGM development effort will expand Mayflower’s military GPS receiver product line to include a modernized NavAssure-M product offering so that its current customers will have a form-fit-function upgrade path from SAASM to MGUE. “The Air Force is very pleased to see innovative GPS technology developed under its SBIR Program to find commercialization opportunity in the MGUE Market. Mayflower has performed well and we are confident of the SGUE Program success,” said Dana Howell, Air Force Research Laboratory (AFRL) Program Manager. “The AFRL/GPSD objective in the SGUE Program is to advance MGUE technology and make it affordable to the warfighter. The SGUE Program fits the need and will lower the cost to the user by increased competition enabled by the SGUE Program,” said Eddy Emile, Chief, Advanced Technology and International Branch, GPS Directorate. Mayflowers’ small SWaP GPS receiver technology will allow the Department of Defense (DoD) and other agencies to benefit from increased competition, enhanced capability, and reduction in overall program costs to DoD program managers and platform prime contractors in upgrading their navigation systems to MGUE. “The development of small SWaP MGUE form-factors, enabled by SGUE CGM, will have a significant impact in the M-code market, providing secure modernized GPS signals to the warfighters and lowering total ownership costs on many military programs,” said Triveni Upadhyay, founder and CEO of Mayflower Communications Company, Inc., based in Bedford, Massachusetts. 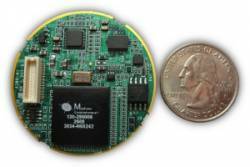 According to Mayflower, the NavAssure-M MGUE receiver form-factors, focused toward small SWaP GPS receiver applications, will be backward-compatible to SAASM, therefore, lowering the platform integration cost and total life-cycle cost.